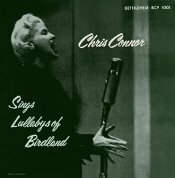 Chris Connor is a jazz singer known for her distinctive style and expression. Born in Kansas City on November 8, 1927. Her father was an eminent musician and Chris soon studied and became proficient in the clarinet. Chris joined the "Snowflakes", a vocal group of Claude Thornhill's band, and moved on to become Stan Kenton's lead singer. She recorded for Bethlehem Records originally and then began a long association with Atlantic records. Her trademark songs are well known to most people familiar with jazz of the 50s and 60s; among them are "Lullaby of Birdland" and "All about Ronnie."